Carl Edwards celebrates after winning the Toyota Owners 400 at Richmond International Raceway on April 24, 2016 (photo courtesy of Getty Images for NASCAR). Carl Edwards claimed his second-straight NASCAR Sprint Cup Series win and the fourth-straight for Joe Gibbs Racing on Sunday with his win of the Toyota Owners 400 at Richmond (Va.) International Raceway. It also was JGR’s eighth win at Richmond in the last 15 races at the track. Teammate Kyle Busch finished second, giving JGR a one-two finish. Even though Edwards led a race-high 151 laps in the 400-lap race, his win came down to a nudge and a pass of Busch on the final lap. 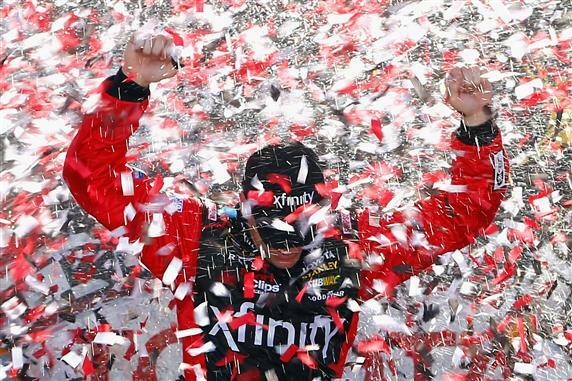 It was the first-ever pass for the win in this history of NASCAR Cup-level racing at RIR. Busch finished second, while Hendrick Motorsports teammates Jimmie Johnson and Kasey Kahne finished third and fourth. Pole sitter Kevin Harvick rounded out the top-five. The yellow flag waved only twice in the first half of the race, but six cautions littered the final 200 laps, with four of those cautions coming in the final 100 laps. After Harvick and Johnson led laps early, Edwards took over, joined by Busch, who ran second to his teammate through much of the first half of the race. For a brief moment, Denny Hamlin joined them to give Gibbs a 1-2-3 of the running order but fell to the back because of a pit road penalty for an uncontrolled tire. He recovered to finish sixth. The fourth Joe Gibbs Racing driver, Matt Kenseth, also had trouble in the form of a batter/alternator problem, but like Hamlin, Kenseth also recovered, finishing seventh and putting all four JGR drivers in the top-10 at the checkered flag. Edwards lost the lead to Harvick on lap 230 and Brad Keselowski also led laps by staying out during a caution to lead laps. Kurt Busch took the lead on lap 278, and Kyle Busch moved into second on the next lap for a brotherly duel up front. Both brothers led laps before Kurt Busch dropped back to fifth because of a slow pit stop during the eighth and final caution of the race with 42 laps to go. Kurt Busch lost more spots when the race returned to green and wound up 10th by the finish. With Kurt Busch out of the picture up front, the race returned to a battle between JGR teammates, specificially Busch and Edwards. This time around, though, Busch was the front-runner with Edwards in pursuit until his last-lap pass for the win. Joey Logano finished eighth after going from the front row to a lap down early in the race. Marin Truex Jr. finished ninth. Tony Stewart finished 19th after starting 18th in his first race of the season after missing the first eight races, recovering from a broken back. He went a lap down fairly early and was battling Logano to get be the first driver one lap down when he suffered a flat tire on lap 268. He eventually got back on the lead lap.